Have you ever watched the nightly news when the regular anchor was on vacation, only to clearly be able to tell that the replacement is poorly reading the teleprompter? What about listened to your favorite morning show when the normal DJ was away and cringe as they continually hit the wrong buttons on the soundboard to queue up soud bites? The point is that while there are always other options, and many of the time the other options are quite good themselves when compared to the general marketplace, the fact of the matter is that the A-team is the A-team for a reason. They are just better. 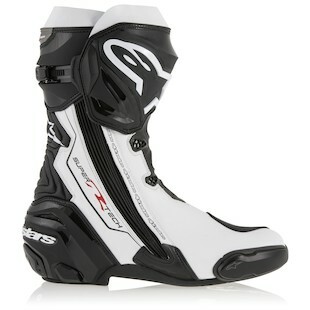 In a nutshell, that is pretty much what is going on with the Alpinestars Supertech-R Boots. They are the best racing/sport boots that are made by Alpinestars and are the prefered boots of some of the world’s greatest riders. While there are other boots out there that do many of the same things as the Supertech-R boots, they just don’t do them quite as well. From the supremely crafted protection that has been anatomically placed throughout to limit the uncomfortable flexions of your foot/ankle in the event of a crash, to the ardent attention to detail that went into the R&D of the Supertech-R boots in order to ensure that they are optimized for their position in an aggressive tuck riding position, Alpinestars held nothing back with these. From the upper echelon of MotoGP to the most skilled track day riders, the Supertech-R boots have been envisioned, tuned, and exist in their current form for the purpose of providing the best riders on the planet with the most precise boots available at any level. The Supertech-R boots are true apex. As of the time of this blog post, they can be seen on 2 of the top 3 riders on the MotoGP circuit. That pretty much says it all.